Note: There is no built-in fuse on the Espruino Pico 1v3 (1v4 contains one). You should check that your circuit does not contain shorts with a volt meter before you plug it into USB, or you may damage your board. BOOT0 Jumper (Advanced) Short this jumper out to connect the button to BOOT0. Plugging the device in with the button pressed will the cause the DFU bootloader to be started, allowing you to change absolutely all of Espruino's firmware. Note: The two jumpers can be shorted out just by scribbling over them with an HB pencil. The Pico is designed to be easy to include in your designs. The 0.1" pins are easy to fit in to sockets, and castellated edges mean that unpinned Picos can easily be surface-mounted directly to a PCB. These parts are also used for a variety of Shims that allow the Pico to be easily attached to other hardware. 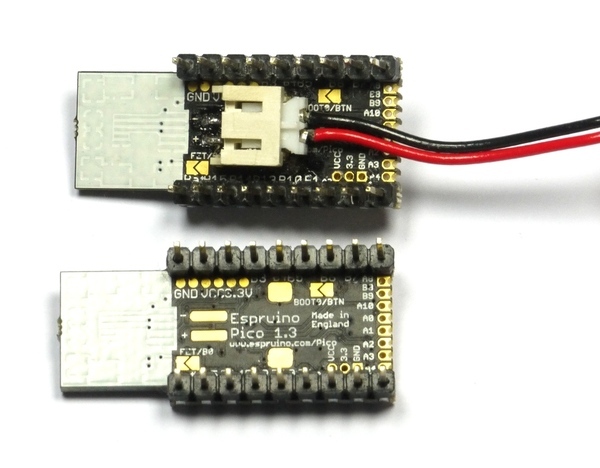 Espruino Pico contains the circuitry needed to power itself from a battery without the voltage drop of a diode. This means that it will run off of normal 3.7v LiPo batteries (or any voltage up to 16v). In order to connect to a battery, you can use either the pins marked Bat and GND (on opposite sides of the board, nearest the USB connector), or you can solder a JST S2B-PH-SM4-TB Battery connector connector onto the underside of the board. Please see the Battery page for information on connectors and where to buy them. On the rear of the Pico Board under the while block of silkscreen, there are pads for connectors. 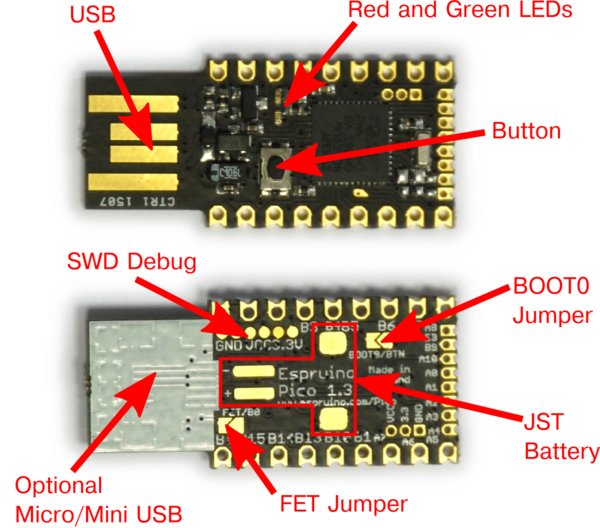 Espruino rev 1v3 has both Micro and Mini USB, but Espruino rev 1v4 only has Mini USB (due to potential issues with Apple's USB extension leads). To use these, carefully scratch off the silkscreen until you have copper tracks, and solder on the connector. The connectors you need are very standard parts. While some parts are listed below, many other parts from many different manufacturers would work perfectly well. Currently the labelling for the Pico's pins is quite confusing (it's different on the circuit diagram, PCB silkscreen, and the Pinout diagram). Hopefully the table above will help to clear it up slightly. Espruino's power circuitry is as above. When USB is connected the device is powered through a Schottky diode with 0.3v voltage drop. However when USB is disconnected then Espruino can be powered from a battery with no voltage drop. This is done by turning on the PFET Q1. When running from USB, use the Bat Pin as a powered 5V output. When running from USB with a battery connected, charge the battery. This last reason is why the jumper is disconnected by default. It could be dangerous to charge a LiPo battery this way unless your software also monitor's the battery's charge. The jumper can be shorted by scribbling over it with a normal HB pencil. See the Pico FET Output tutorial for an example. In very rare cases (if you are experimenting with writing to Flash Memory), you may be able to damage the bootloader, which will effecitively 'brick' the Pico. To fix this, you'll have to use the hard-wired USB DFU (Device Firmware Upgrade) bootloader. 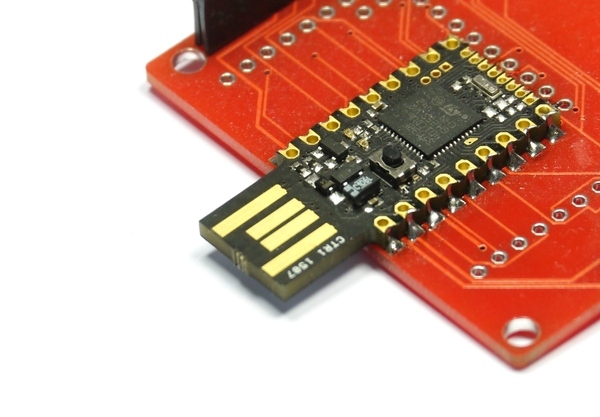 You can also use this method for flashing non-Espruino firmwares to Espruino. Short out the BOOT0/BTN solder jumper on the back of the board - you can do this by drawing over it with a pencil. Use the DFU tool to flash the firmware. Using the GUI on windows, or with the command sudo dfu-util -a 0 -s 0x08000000 -D espruino_binary_file.bin for dfu-util on Mac/Linux. Un-short the BOOT0/BTN jumper to re-use the original Espruino Bootloader. If you used a Pencil mark then you may need to use cleaning fluid and a small brush to totally clear out the graphite. Note: If you can't access the bottom side of the board (maybe it is soldered down), on rev 1v3 boards BOOT0 is available via a gold teardrop-shaped pad on the top of the board. Short this to 3.3v while applying power to enable DFU mode (holding down the button is then not required). The Pico also has SWD Debug connections on the back of it. An ST-Link debugger (or ST Discovery/Nucleo board) can be connected to these connections for fast firmware uploads and source-level debugging of the interpreter itself. See the AdvancedDebug page for more information.